After well over 30 years organising races it came time, at the end of 2017, to say 'That's all Folks!' Don't worry we are still organising the Yorkshire senior and junior champs, Inter County teams; and taking photos of you all enjoying and sweating on the hills, mountains, bogs and Dales we all love. So expect to still see us out and about encouraging you all whether you're having a good day or bad. 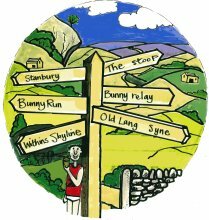 From 2018 the Woodentops races have new organisers: Wharfedale Harriers and its members will be taking on the races. They have assured us that they will keep the ethos and tradition of how all our races are run and keep the Woodentops fun element thriving.